Invisible Ph t grapher Asia (IPA) presents IPA PHOTO CAMP HANOI, an exploration of personal photography in Hanoi, Vietnam. 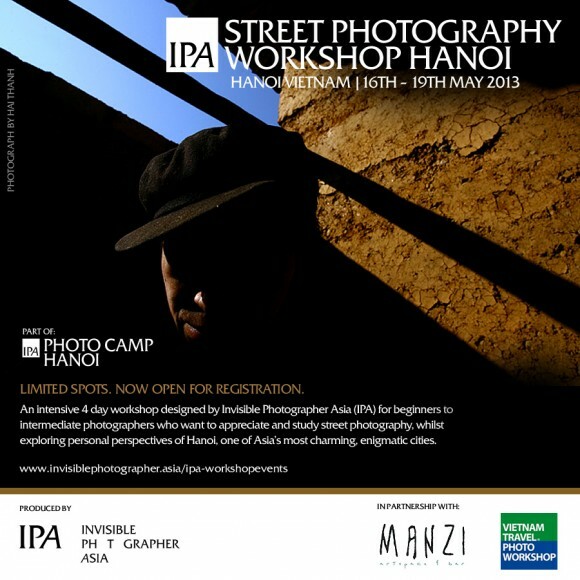 Taking place from 16th to 19th May 2013, IPA Photo Camp Hanoi includes an intensive 4 Day Street Photography Workshop and an evening of Photo Presentations featuring a selection of Vietnam’s new breed of Photographers and Artists working on personal stories and projects. Venue: Manzi Art Space, 14 Phan Huy Ich Street, Ba Dinh District, Hanoi. A Free Public Talk and Presentation of Personal Photography in Vietnam and Asia hosted at Manzi Gallery, one of Hanoi’s newest art and creative spaces. Presenters include Vietnamese photographers Hai Thanh, Maika Elan, Binh Dang and Pham Ngoc Lan and Kevin WY Lee, founder of IPA. This Photo Presentation is FREE and Open to Public. An intensive 4 day workshop designed by Invisible Photographer Asia (IPA) for beginners to intermediate photographers who want to appreciate and study street photography, whilst exploring personal perspectives of Hanoi, one of Asia’s most charming, enigmatic cities. 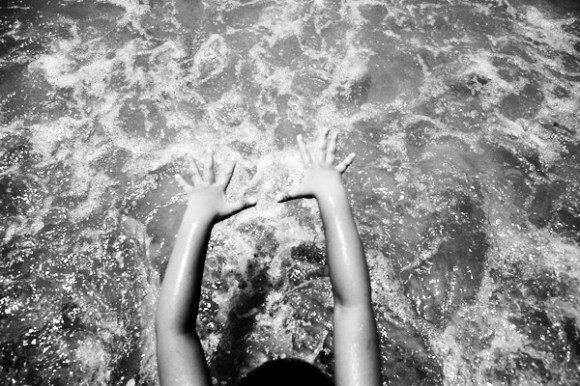 The course will include portfolio reviews and explore concepts from practical photography to editing and curation. 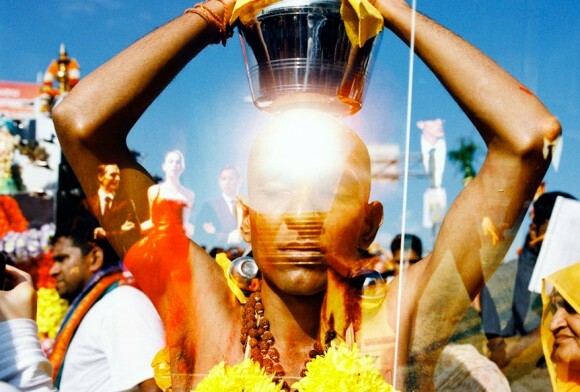 Participants will develop their skills and photographic voice in tune with the practice and sensibilities of contemporary street photography. 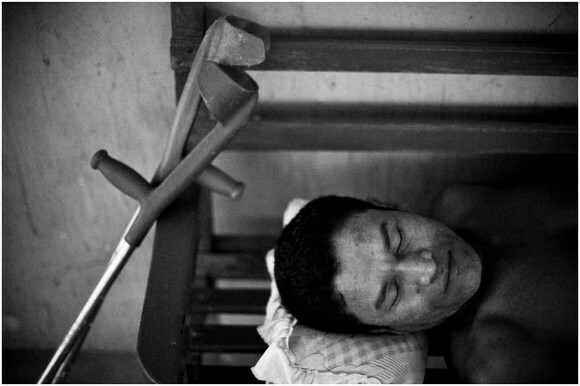 The workshop will be led by Kevin WY Lee, founder of IPA, along with veteran Vietnamese photographer Hai Thanh and guest mentor Maika Elan, recent World Press Photo 2013 Winner. 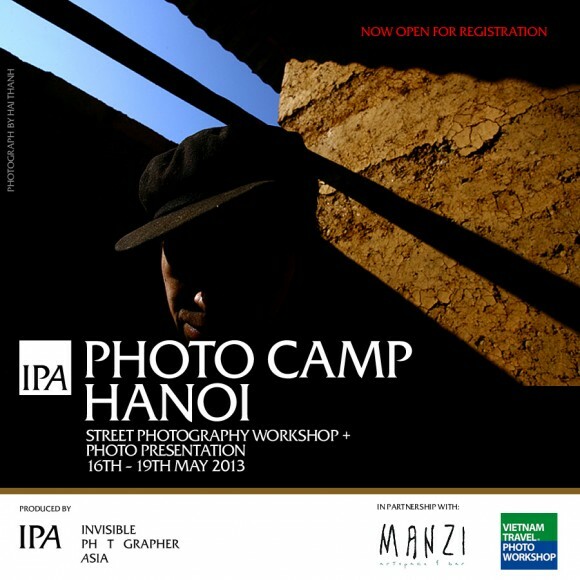 This workshop and IPA Photo Camp Hanoi is produced by Invisible Photographer Asia (IPA) in partnership with Manzi Art Space and Vietnam Travel Photo Workshop. We are an Australian homewares label, and we are looking for a photographer to come with us to our pottery studios in Hanoi and take some photos for our marketing material. I’m wondering if you have someone to recommend? please advice me regarding the hotel reservation for the photo camp in Hanoi. will you be able to book the hotel for me ?? You can book Hotels in Hanoi on Agoda.com. The process is simple and easy. We will provide recommendations to participants who sign up. Thanks.